In a medium saucepan over low heat, cook and stir condensed milk and cocoa until smooth and slightly thickened, 5 minutes. Remove from heat , and allow to cool slightly. Stir in heavy cream, light cream, and vanilla. Refrigerate until cold. 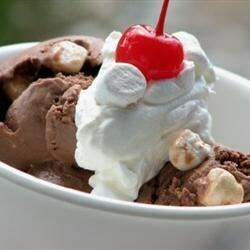 Pour mixture into the canister of an ice cream maker, and freeze according to manufacturer’s directions. Stir in nuts and marshmallows halfway through the freezing process.